Brush up on your anatomy with these amazingly detailed sculptures. Excellent anatomical references that are also great sculptures in their own right; you'll probably want to own all three. Most artists will be aware of the array of écorché sculptures that are available these days, mostly male and female human anatomy and in a range of styles from full écorché to planar. Firstly, what is écorché? It simply means ‘skinned’ in French and in this context it refers to an anatomical model or sculpture that has had its skin removed to help an artist understand what’s going on underneath. 3DTotal has a large range of figures available and they have been very popular for some time now. This new range adds to that growing collection with a dog, a horse and a large cat, covering three of the more popular large mammalian families. Any creature artist whether 2D or 3D will surely tell you how important real-world anatomy is to their workflow. Simply put, if you are designing creatures you will be learning muscle insertion and origins (where they start and end on the skeleton) and how they interact with each other as they flex and extend. These models are done with half of the body flayed and half with their skin on, which makes them perfect for seeing how a muscle group affects the surface form. If you are used to using photographs/videos or references from Google when it comes to modelling creatures for 3D art, you will quickly appreciate how much you can learn by being able to hold a creature in your hands to study it, and having the different mammals (two carnivores and a hoofed mammal) side by side allows you to compare the different families. The models are finished in a flat, grey resin that matches all the other models in the 3DTotal line-up and the detailing is amazing, even showing some of the larger veins. The models come supplied with a rectangular base that is signed by the designer and it’s simply a case of slotting the feet of each animal into the holes. The horse and the dog have their tails attached but the cat comes with a magnetic tail. The scale for the creatures differs between them and that does mean the horse seems a little out of scale. I assume this is simply because to create a horse to match the cat and dog would have made it prohibitively expensive/large, but this really is only a tiny issue. 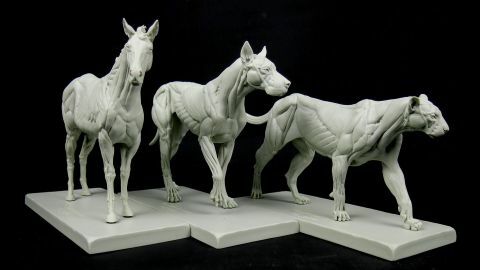 Overall, this is a must-have set of figures for creature designers of all types. An amazing addition to the 3DTotal écorché line-up and one that will almost certainly leave artists asking for more diverse animal families in the future. Great as an individual piece but even better as a set. This article was originally published in 3D World magazine. Read more: How to master creature anatomy.